Carrot beetle (Ligyrus gibbosus) - Found throughout the continental US, southern Canada, and northern Mexico. Adults are reddish brown, ½" long, and feed on the roots, lower leaves, and stems of sunflowers, dahlias, lilies, and iris. Sunflower plants may look stunted or ‘hungry’ and may wilt or die from compromised root systems. Controls include attracting adult beetles to light at night to collect or kill, attracting or encouraging native predatory ground (carabid) beetles, or attracting vertebrate predators. Insect sprays are not extremely effective due to this pest's ground-dwelling nature. Click here to see an image. Sunflower beetle (Zygogramma exclamationis) – Found throughout the continental US and southern Canada. Adults are about ¼ to a ½” long, have creamy colored elytra (wing covers) with four black stripes (the stripe on the outer edge is reminiscent of an exclamation point), and red-brown heads. Adults overwinter in soil and feed during the day on newly emerged sunflower seedlings. Larvae feed at night, hiding in terminal buds during the day. Natural predators include carabid beetles, lacewing larvae, lady beetles, damsel bugs, stink bugs, and pirate bugs. This pest is susceptible to pesticide sprays that are applied during active larval feeding times. Recommended OMRI-listed pesticides include: Monterey Garden Insect Spray (#9107, #9481, #9484) and Pyganic® (#9192, #9532). Read all product labels in full and follow label instructions as specified for that particular product. Sunflower Stem Weevil (Cylindrocopturus adspersus) – Found throughout the US and southern Canada. Adults are about a ¼” long, gray-brown, and feed on leaves and stems. Adult females lay eggs in stem tissue at the base of a plant. Larvae emerge and feed on the stem tissue and, as they pupate, begin feeding on the soft, spongy center of the stem (pith). They eventually make their way to the crown where they create a place to overwinter and emerge as adults the following spring. Damage can be extensive if large populations are present, resulting in lodging of plants in the field. Delayed planting is recommended where populations are known to be high. 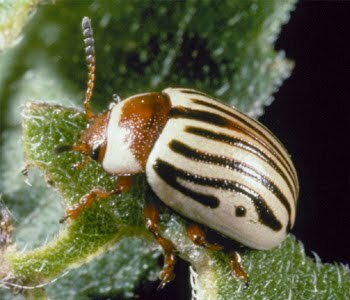 Foliar sprays at about the 10-leaf stage are also effective in controlling this pest in the adult stage. Once the larvae are in the stem, insecticides are not effective. Recommended OMRI-listed pesticides include: Monterey Garden Insect Spray (#9107, #9481, #9484) and Pyganic® (#9192, #9532). Read all product labels in full and follow label instructions as specified for that particular product. Aphids (several species: Macrosiphum spp., sunflower aphid (Aphis helianthi) and melon aphid (Aphis gossypii)) – The ability to produce many generations per year make aphids a significant pest if pressure is high. Damage presents as overall plant decline due to the aphids sucking sap from leaves. Natural enemies are easily attracted with beneficial insectaries, try our Beneficial Insect Attractant Mix (#1832), planted nearby. These insectaries attract green lacewings, hover flies, parasitic wasps, and lady beetles. If populations reach levels that warrant intervention, we recommend the following pesticides: Monterey Garden Insect Spray (#9107, #9481, #9484), Pyganic® (#9192, #9532), Safer® Insect Soap (#9370), Golden Pest Spray Oil™ (#9534, #9535), and Liquid Rotenone-Pyrethrin Concentrate (#9336). Read all product labels in full and follow label instructions as specified for that particular product. 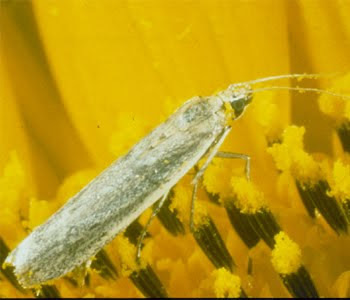 Sunflower Moth (Homoeosoma electellum) – Found throughout North America, but more common in southern regions. Adults are small, shiny, buff- to grey-colored, and lay eggs on the open face of the flower. Larvae hatch to feed on pollen, pollen in the disk flowers, and on the ovaries of the flower, successively in that order as they pupate. Webbing is seen across the face of the flower where larvae are present. Damage done by feeding larvae can cause empty seeds and make plants susceptible to Rhizopus Head Rot. They overwinter in a cocoon and emerge as adults the next year. This pest is best controlled with insecticides, the best being: Dipel® DF (#9713). Read all product labels in full and follow label instructions as specified for that particular product. For more information on these and more sunflower pests and how to control them in your area, refer to your local cooperative extension office, a service of your state’s land grant university. Sunflowers are a bright and happy flower that look great all summer long. As an added bonus, you can roast the seeds and have a healthy snack. Learn the basics of growing this beautiful flower.Sunflowers pests looks beautiful. Pest control services need to be hired on regular basis in home for the proper cleaning and fresh environment. Top Pest Control is the cheapest pest control singapore who provides the pest control services at an affordable price.